Tomorrow night, when Kentucky plays Louisville in the Final Four, I’ll be sitting on my couch in Brooklyn, and filled with the anticipatory feelings of a person who, born in Lexington and brought up to listen to what his grandmother tells him to do, eschewed smart bracketology to pick the Wildcats to go all the way. And I’ll be eating beer cheese, a Kentucky specialty, with crackers and chips. 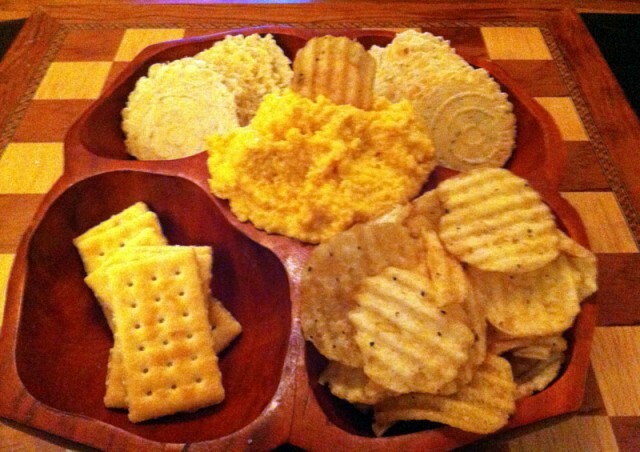 It’s a simple spread, and ridiculously easy to make, and I invite you to prepare some too, because even if you aren’t rooting for the ‘Cats, or don’t care a thing about basketball, beer cheese is delicious — second only to bourbon whiskey as Kentucky’s finest contribution to global cuisine. As with most great foods, some legend and nonsense swirls around the origins of beer cheese. But most seem to agree that it was invented in the 1940s by a Kentuckian named Joe Allman, and first served as a complimentary bar snack at his brother Johnny’s various restaurants along the Kentucky river. The Allman family still sells a packaged version, which is one of several brands available throughout central Kentucky. There’s even an annual festival dedicated to the snack. But homemade is best, and it’s easy to do. Your main ingredients will be sharp cheddar, cheap beer and raw garlic. Start by grating a pound of sharp, room temperature cheddar. A blend of cheeses is fine, if that’s your style, but it should be a blend of various sharp cheddars. An economical strategy is to use three quarters of Boar’s Head or Cracker Barrel to one quarter of something a bit spendier. Throw the grated cheddar into a food processor. Next, finely mince anywhere between two and four garlic cloves, according to your preference. You are going to be serving this garlic raw, so really mince it within an inch of its life, because you don’t want anyone to end up chewing on a big chunk. Also, in case this isn’t already clear, do not attempt to make out with anyone for a few hours after you have eaten beer cheese. Put the miniscule garlic pieces into the food processor. Next up: spices. Keep in mind that this is not a mild snack, and doesn’t need a ton of help in the flavor department. So we’re going to be conservative, at first, and then mess around with the spices later to make sure we got them right. Add one teaspoon of hot sauce (I like Tabasco for this, but you can go your own way) and one teaspoon of Worcestershire. Also put in a pinch of cayenne pepper and another pinch of dry mustard powder. Turn on the food processor, and pulse everything up so that it’s all finely chopped and mixed. Now for the star of the show: the beer. Your instinct will probably be to tart this thing up with some sort of hand-crafted Belgian masterpiece, but, like picking UNC to win the tournament, that would be an error. Beer cheese is best prepared with low-grade beer, particularly when very flat. A lot of recipes even call for the beer to be stale, which got me thinking that this whole thing was probably the creation of a barman who was trying to figure out what to do with leftover beer. So drink the Belgian stuff, and put the old PBR that someone left at your last barbecue in the beer cheese. You need a single can or twelve-ounce bottle. If you have time, pour the beer into a bowl and let it go flat in the refrigerator overnight. If your fridge smells like the carpet from your college dorm room the next day, you nailed it. Let the beer come up to room temperature. Once you’ve pulsed the other ingredients, turn the food processor on at a low setting, and slowly add the beer via the food chute. When you’ve got about three quarters of the beer mixed into your cheese, turn off the processor and check the consistency. You’re looking for a reasonably thick spread, with a balance between beer flavor and creaminess. 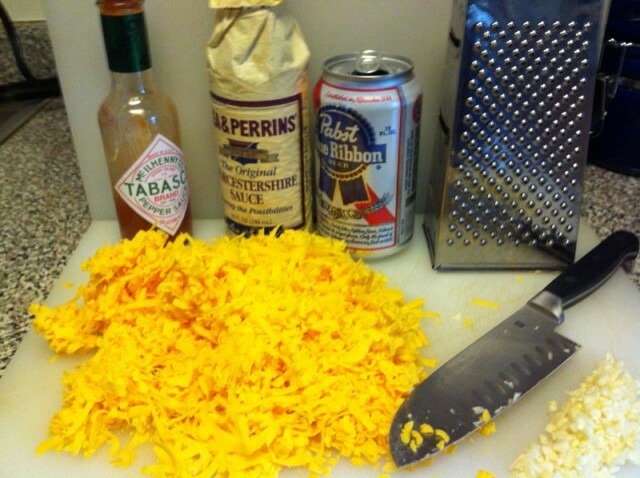 If you added too much beer, balance it out with a bit more cheddar. If it seems unpleasantly porridge-ish, add more beer. If the beer cheese is too watery and you simply can’t add any more products, a night chilling in the fridge will bring it in line. Keep in mind that this is not the most photogenic of foodstuffs, and a glossy photo of a batch will most likely never grace the cover of Food and Wine. This is often the case with things that are delicious. When you’re satisfied with the consistency, check the flavor. You’ll most likely want to add some salt and pepper, but if you’re like me you’ll also add more hot sauce. There are a few other things that would make sense: a finely diced white or yellow onion, perhaps, or some horseradish or red pepper flakes. When you’re satisfied with the taste, refrigerate your beer cheese for at least an hour. It’s traditionally served with Saltines, but good with just about any cracker. Also pretzels, carrots, celery, or on toast. 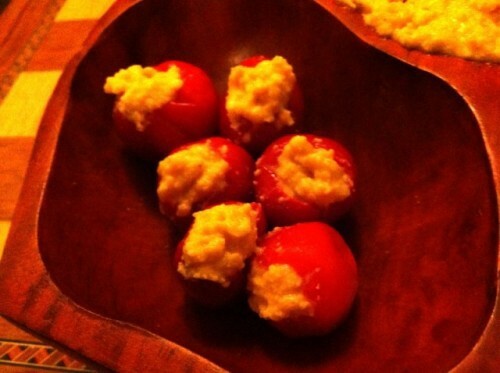 Or, for an Awl-inspired insane flavor bomb that is not for the timid: stuff it into some peppadews. Hope you enjoy, and let’s go ‘Cats.